The Winter Newsletter has been printed. You can read it by clicking here. If you would like to subscribe (it is usually published twice a year), please send an email to shipp@pyareohome.org. Please specify if you would like to receive it via the US Post Office or by email. Include the appropriate address. We will be having our Garden to Table event on Sunday August 27, 2017 at 5:30 We will be serving a light Mexican dinner and a dessert. A slide show presentation by our friend, artist David Wiggins will round out the evening. Contact Pyareo Home for reservations. Limited seating! 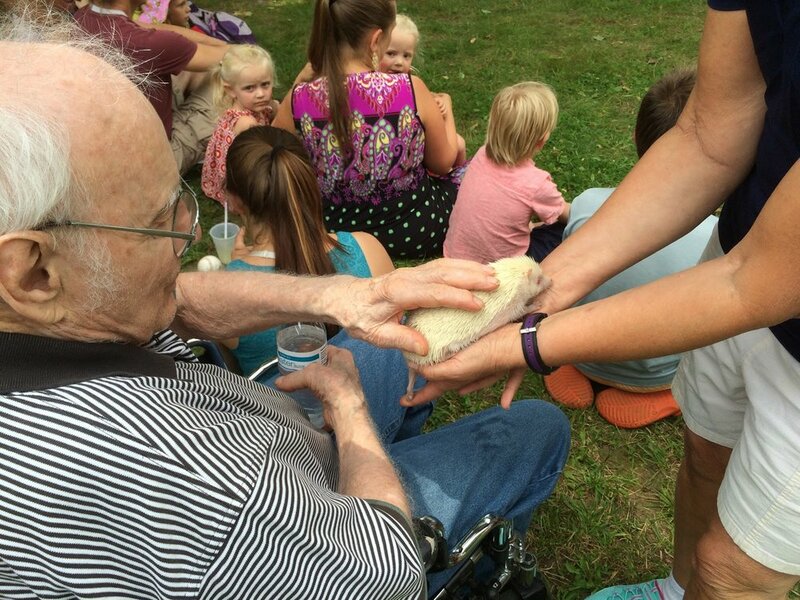 Some of the residents and staff had a great time at the yearly Old Home Day in Sanbornton square. Pyareo's first seasonal Farm to Table dinner was served Sunday May 21st. Without a lot of fanfare, we had a full house of guests from the community, board members, staff and families. The dinner featured a sample of the quality vegetarian fare offered to residents. It was prepared and served by the home’s kitchen Staff, Ann Matty, Pamela Prescott and Christina Nagel. The menu featured a leek and garden pea soup, followed by a burst of spring spinach salad. The main course consisted of fresh asparagus quiche with roasted butternut squash with caramelized onions. Desert was a rhubarb crisp. Local produce included asparagus and rhubarb from our friend Tim Gallagher. We had music by caregiver, Sarah Frazier, and Bill Barnum read a number of his dramatic original poems. Stay tuned for the next Farm to Table Dinner. April showers bring May flowers! Celebrate Spring! And support Pyareo Home at the same time!